Due to its rapid Growth the Arabic Emirate of Abu Dhabi is considered to be among the most modern cities of the world. Its impressive high-rise towers and architectural distinctive buildings with the generously expanded roads and highways characterize the cityscape. 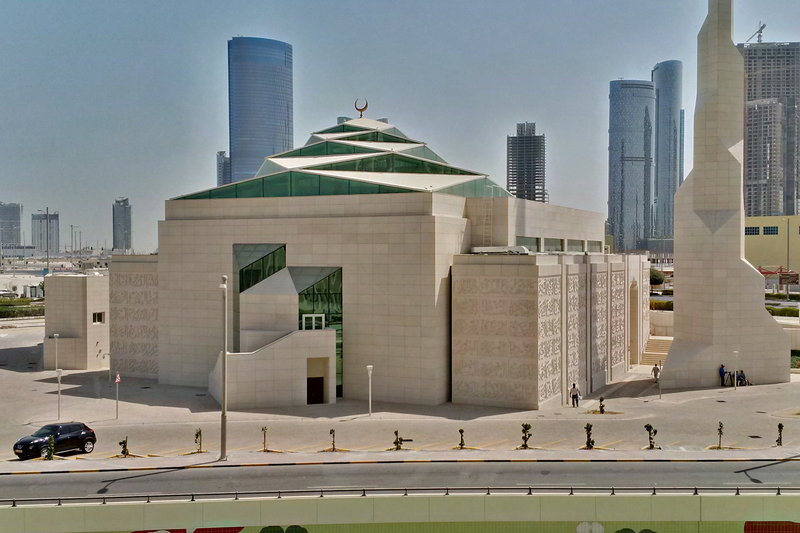 Part of such buildings are a large number of newly constructed magnificent Mosques such as for example the Al Aziz Mosque which has been opened with the beginning of Ramadan 2015 on the Al Reem Island. Architect of this project is the reputable APG Architecture and Planning Group who is responsible for many prominent projects in UAE and in the arabic World. With this new Mosque APG has introduced innovative and new ideas and concepts with the use of Light Transmitting Concrete technology for the construction of unique and distinguished Facades. 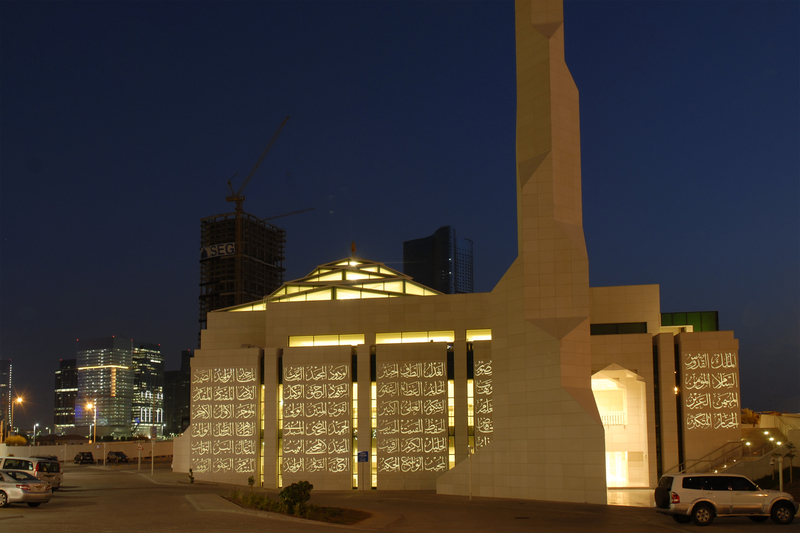 The Al Aziz Mosque Project was provided with worldwide unique and impressive Facade elements that were designed, produced and installed by LUCEM Lichtbeton. To show their social commitment and responsibility towards the Islamic Society, the Abu Dhabi based client Hasan Abdullah Mohammed Group (HAMG), a private investment Group, has donated many Mosques to several locations in the UAE and other arabic countries including the most recent AL Aziz Mosque in Abu Dhabi comprising a total area of 5100 square meters distributed over 3 floor levels accommodating a total of 2270 worshipers. The client HAMG entrusted APG Architecture and Planning Group with the task to provide the mosque with a new special and distinguished Architecture to present the Al Aziz Mosque as a Monument in Abu Dhabi. The result that crowned this monument was a 515 square meter external LUCEM facade consisting of 207 elements of approx. 1800 x 1400 x 40 mm each. Every single element is in all respects individual as it comprises a different shape and construction making the whole concept a unique one worldwide. Especially during evening and night time, when the walls become backlit, the glowing calligraphy becomes a highlight in Abu Dhabi, the capital of the United Arab Emirates. 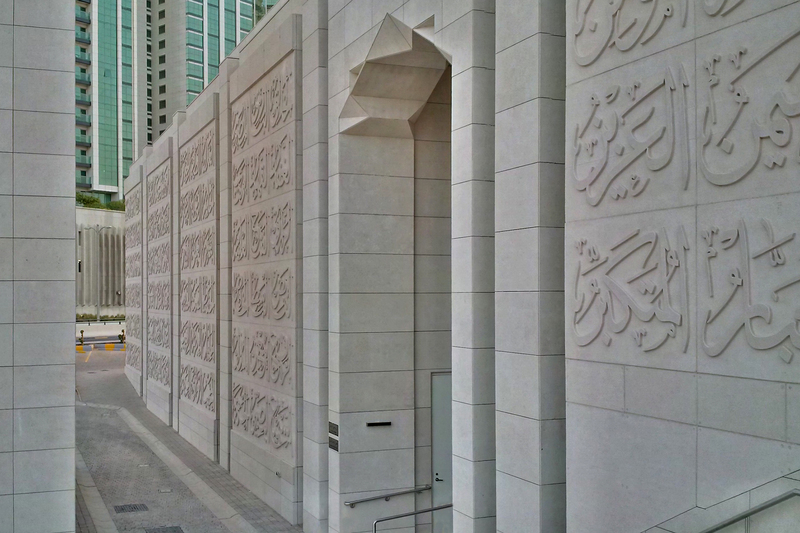 Arabic letters of the different Calligraphy on each individual panel protrude in a thickness of 30 mm out of the Light Transmitting Facade Panels forming during the day hours a stunning optic of a Natural Stone Facade with a state of art design incorporating the shadows of the Calligraphy created by the sun light. The whole Facade comprises the 99 different names of God distributed on different elevations of the mosque in accordance with strict instruction of the holy Koran. During the day the escalation in the Facade art start at dawn of each evening when the Light Transmitting Facade starts its light show after the activation of the LED lights installed behind the backside of the Facade panels – a technology developed from German company LUCEM. The light transmitting fiber optics transmit the lights of the LED lights to the external surface of the protruding letters. Each Facade element is a massive Concrete panel that is absolutely weatherproof and can withstand extreme Temperatures usually prevailing in the summer months of the United Arab Emirates. The Surface of the Facade elements has been treated to ensure resistance of the erosion caused by sandstorms. It is also worth mentioning that each and every LUCEM Facade Element is unique as it has been casted in individually and uniquely tailored mould following detailed consideration of the exact dimensional requirements and tolerances to ensure accuracy in the execution of work especially at corners or areas with openings. The idea of reaslising calligraphy on the surface of light transmitting concrete for this project was created by APG (Mr. Yasser Fouad)/Abu Dhabi, ALD (Mr. Wolfgang von Zoubek)/Germany and LUCEM (Mr. Marijan Barlé)/Germany. Based on the client’s request the surface of the LUCEM Light Transmitting Panels was sandblasted in a way to reflect the optic of a hand carved natural stone to match other natural stones used on other areas of the mosque. LUCEM also managed to produce the concrete elements pigmented in a precise way to match local natural stone color used on adjacent areas. The intention of the architect Mr. Yasser Fouad (APG) was to integrate the mosque to the surrounding buildings of the new area Reem Island. Color and surface of the entire mosque were designed to be smoothly fitting to the area’s appearance being at the same time a sort of sculpture rising from earth. Due to the the specific chosen color of the natural stone and the concrete color, it seems, as if the mosque was formed from the sand below. Depending from sunlight angle, the LUCEM façade appears in different colors. During daytime with no direct sun of the façade it appears in a warm sand color, during sunset with intense direct sunlight on the façade in 90 degree angle on the surface in a strong color of soil, after sunset respective during twilight in the morning or evening it appears sand-grey to grey. In night time with the darkest ambient light, it appears – as an impressive natural occurance in architecture – widely shining and glowing in a soft warm white color like the moon and the stars, the Arabic calligraphy. At the same time, the design of the architecture is straight and modern, new age design, based on squares and triangles instead of circles and rounded forms of traditional mosque design. The whole Facade comprises the 99 different names of Allah distributed on different elevations of the mosque in accordance with strict instruction of the holy Quran. In order to produce the exact Light Transmitting Panels according to the client’s requirements for the Al Aziz mosque a highly experienced Calligrapher specialized in the Islamic Arts and different Calligraphy was employed to prepare the hand drawings for the 99 different names of Allah and assign the location of each in strict conformation to the holy Koran requirements. These were then digitalized and transformed by the project’s architects to AutoCAD format that were then used by LUCEM for the preparation of the individual molds, arranging the fiber optics required and casting of the panels with a high strength concrete. . The letters protruding a remarkable 30 mm resulting in an increase the thickness to 70 mm of the panel with an average dimension of 1800 x 1400 mm. The weight of such panel would be 300 kg. One panel had to be produced with a dimension of double as much 3600 x 1400 mm and was weighing 600 kg. The installation method for the Light Transmitting Concrete Panels is handled the same way as for the conventional curtained ventilated Natural Stone Facades. For this project 16 undercut Anchors were used to fix each panel to a channel based substructure system fixed to the concrete structure of the mosque by means of Chemical and mechanical anchorage system. The references that LUCEM realized in cooperation with reputable Architectural firms include prominent projects such as the worldwide 1st Light Transmitting Concrete Facade at the RWTH Aachen, Wall Panels at the building of Bank of Georgia in Tiflis and the Signal Iduna Headquarter in Dortmund as well as Counters in ARUP Centre in Moscow, Arabella Sheraton Hotel at Spitzingsee, THE ROOM Bar + Club at Radisson Blu Hotel Hamburg and Sinizy Bar in Moscow. Another large project is a Prayer Hall in Qatar that was completed in 2013 in cooperation with the reputable Rem Kohlhaas Architects in the Netherland and the Nino Arabella Restaurant Chain from Kuwait. The worldwide highest LUCEM Light Transmitting Concrete Facade that is currently being realized is a continuous 40 meters high Facade in Izmir Turkey, a high quality Apartment-complex with 28 Apartments. Abdruck honorarfrei. Belegexemplare erbeten. / Copy in kind of publication requested.